This month, Diverse Solutions proudly features domaproperties.com for our client spotlight series. Based out of Long Beach, California, Doma provides an excellent example of a site that couples Diverse Solutions products with a talented developer to achieve some really fantastic results. The most apparent aspect to any visitor is the aesthetics of this site. The layout is tasteful, clean and easily navigable. The home page provides navigation tabs at the top of the screen for easy direction to specific pages, along with a custom quick search option, social media links and contact information. Any consumer landing on this website will surely feel comfortable in their browsing, as Doma Properties provides a truly enjoyable experience. As mentioned, the homepage displays a custom quick-search module that allows visitors to search for homes based on location, price, bedroom, bathroom and type. This quick-search is impressive not only for its functionality but also for how beautifully it fits within the theme of the site. Offering an easy search option on the homepage entices visitors to continue to browse which can improve the stickiness of your site. The custom quick-search option on this site was created by a developer, however, once the aforementioned fields are filled out, the results are displayed using Diverse Solutions dsIDXPress Pro. Keep in mind that dsIDXPress Pro is a fully customizable plugin that allows forced registration options which can convert site visitors into leads. Another feature on the site includes a tab to search unique architecture within Doma’s listing area. This section highlights significant structures and communities the Doma team works in and also provides the site with rich content and photos. Doma Properties also makes great use of our dsSearchAgent. This feature is easily located on each page under a “Map Search” tab in the top navigation bar on the site. The site also features a “Listings” tab which features the office listings using dsIDXPress Pro. We also love a site that is rich with social media connectivity and Doma Properties provides that in spades. At the top of each page, we are supplied with an email option as well as a telephone number, while at the bottom we see various icons leading to social media sites ranging from Pinterest to Linkedin. Another way that the site provides rich content is through its regularly updated blog. The blog covers basics such as recent listings but also discusses community events and home decor ideas. Remember, activities such as regular blog entries and cross-connection to social media can really improve the visibility of your site and may even help with search engine optimization (SEO). We all know that Diverse Solutions products are stand-out on their own, but Doma provides us with a great example of what can be done if these products are used in conjunction with a site developer that can provide extra customization. Nice work, Doma Properties! Very nice website!! I love the customization along with DS products..
It’s beautiful. It’s not working right now, something about “account data failing to load”, but it’s beautiful. Eric from http://www.TRIBUSgroup.com here. 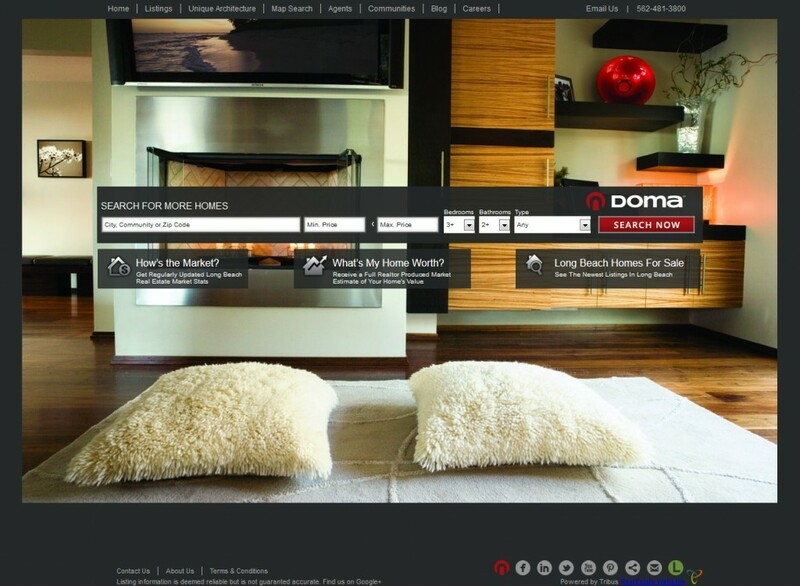 Our team created the Doma Properties site. Thanks for the message about the service being down. We were performing some upgrades and improvements to our sites over the weekend. The site should be functioning correctly now. Take a look through. Thanks so much Erik! I’ll be sure to let our design team know you liked their work. Please let us know if we can ever help you freshen up your site! Superb! This will create changes in your business activity. This site has a bug. I’m working on a Dell all-in-one desktop running Windows 8 Pro with Internet Explorer version 10. When I do a search on the site the results come back in a format for a mobile device even if I don’t tell it that I want a mobile version. When I look at a specific listing only part of each photo is shown. There’s no link on the page to let me switch off the mobile theme. The site does not have this problem when I use the Chrome or Firefox browsers. There also isn’t a problem when I run a search on my laptop running Windows Vista and Internet Explorer version 9. I’m finding this bug in other sites that use the dsidxpress plug-in.